BUY used optical comparators or TRADE IN on new orders! Customer "Swap Service" - we will find a PreOwned comparator matching your current unit, update it, and swap it out! The Certified PreOwned class of optical comparator offered by CCP is a previously owned optical comparator that we as an accredited A2LA optical comparator service provide through our experience, service history, calibration (to original factory specifications), and inspection of the unit have determined to be in exceptional condition and merits resale "as is." Upon request, CCP will quote installation and certification of the machine to original factory specifications at the customer's facility. This is an exceptional value backed with A2LA confidence. Being that the machine is "preowned" it may have cosmetic blemishes that will not affect the operation of the machine. *Complete repainting of covers will be done only when, and if, the machine condition warrants. All Preowned and refurbished machines may have cosmetic blemishes. 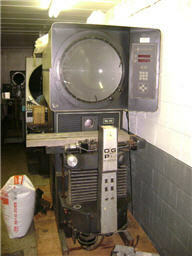 J&L Metrology, Kodak, Excello, CCP, or OGP manufactured models only - "We are the OEM"